When did you last take a grammar class? Were you about 12 or 13, wondering when the class would end? Were you passing notes, nodding off, wishing you were somewhere else? Did you learn anything? Did you really care about such stuff at that age? Take comfort: you’re in good company. Although grammar is the foundation of all writing and speaking, too many of us weren’t paying attention when we were being taught the rules. How could we have known we’d need that stuff when we grew up? And even if we were paying attention, we probably have forgotten most of what we were taught. 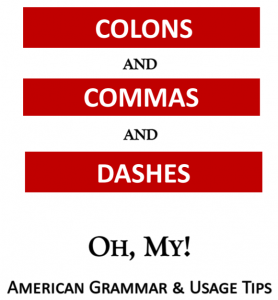 We’re totally confused about commas, semicolons, and colons. And apostrophes? Do you really know how to use them in possessives or contractions? I will give you certainty. I will give you security. I will give you the American grammar information you need to succeed. Brush Up on Your American Grammar Skills incorporates punctuation and usage guidelines into a fast-paced half day of grammar information aimed at you, the adult business professional. It incorporates the most useful and necessary information that you need to succeed. Punctuation rules for apostrophes, colons, commas, dashes, hyphens, quotation marks, and semicolons. Oh, did I mention quizzes? Yes, quizzes. We start with a quiz to assess your knowledge. Then we talk about every issue in that quiz. And there are more quizzes. At the end, you have what you need: all the rules spelled out. In just three hours, I can get you and/or your staff back on track and save you time, money, and embarrassment. If you’re not sure about this, send for my FREE quiz (with the answer sheet). It’s in a pdf format, and I’ll be happy to send it to you so you can see how much you remember about this topic. I warn you: it’s a tough one. Connect with me on LinkedIn / Medium / beBee / Pinterest!